A couple months ago, Snapchat announced that anyone with an account could submit custom Geofilters. This is huge news, especially for local businesses. For those who aren’t familiar, Snapchat is a messaging app with well over 100 million users. A Geofilter is a filter that a user can put on their video or image when they are in a certain location. For example, if you visit the Empire State Building, you can use an Empire-branded filter in your post. Previously, Geofilters were only available to those who applied for one. But now, any user can create a custom Geofilter for a location and time period. Right now, Geofilters are extremely cheap. They start at $5 per 20,0000 square feet, per hour. Snapchat does have limits; you can’t exceed 1 million square feet, and the longest amount of time a filter can run is 30 days. They are being used quite a bit for concerts and events, but beyond that businesses are severely under-utilizing this feature. Before long (12-18 months), more businesses will catch on, and the app will become over-saturated with custom filters. But until that time, you can capitalize and generate a ton of impressions for your business. And these impressions are far, far more valuable than a typical ad. Snapchat is designed to have content delete after only 10 seconds, or 24 hours for posts on a user’s story. Therefore, when people consume content on Snapchat, they are very actively consuming it - knowing they’ll never be able to see it again. Creating a custom Geofilter is fairly easy (you can do that here), and there are a lot of online posts explaining the step-by-step process of how to do it. So for the remainder of this post, I want to provide some ideas for how you can utilize Geofilters for your business. Some of these ideas are a bit outside the box, and if nothing else, they can provide inspiration to help you develop even more ideas. In any of these circumstances, you want to tell your customers that you have a custom filter and encourage them to use it - otherwise they may not know you have one. One-Time Events: If you host ticketed events throughout the year, you should be using Geofilters. This can include New Year’s Eve parties, 4th of July parties, lock-in events, etc. It’s probably best to use Geofilters for events that don’t occur on holidays, as the holidays will likely have their own filters you have to compete with. Grand Opening: If you are opening a new business, a Geofilter is a great way to get impressions for your grand opening day/weekend. New Attraction Opening: For existing businesses, the completion of renovations, expansions or new attractions are perfect candidates for a custom filter. If you invest money to improve your business, you want as many people to know about it as possible. Business Partnerships: A lot of business owners like to cross-promote with other local businesses. Geofilters can be an interesting way to do that. If a partner business is hosting an event that you’re involved with, offer to pay for a co-branded Geofilter. Anyone using the filter will see both brands, and you’ll get exposure from their audience (and vice versa). Scavenger Hunt: Geofilters don’t have to be located at your business. A lot of companies have already set up temporary filters at popular locations in their city as a type of guerrilla marketing to surprise customers. Instead of being a surprise, let your customers know about it. Create a filter for a certain location in your city or neighborhood. Then, on social media, offer clues to where the Geofilter is located. Give a prize for the first person to find the location and use the filter in a snap. It's basically a scavenger hunt that encourages people to interact with your brand and share your content to their followers. 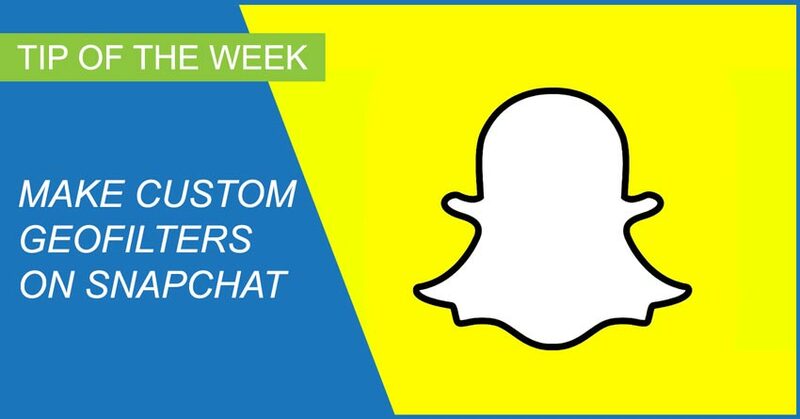 If you don't already have a Snapchat account for your local business, you need. one. There are more than 100 million active users on this platform, and the majority of your target market (tweens, teens, and young adults) are heavily using it. These Geofilters are a way to enhance your Snapchat strategies, and their value won't last forever. Get on board now before the rest of the marketers catch on and over-saturate the platform.